Air side chair works well in both indoor and outdoor spaces, sharing a completely unique look and take on the side chair. The contemporary design of this chair includes plenty of personality and will give your space a boundless amount of character. 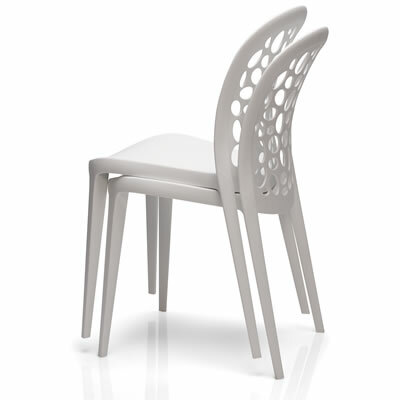 Each chair is molded from a heavy-duty white hard plastic and features a unique backrest design with cutouts. Conveniently stackable and versatile, Air chairs are sold in sets of two and will arrive fully assembled. The Air side chair has been designed to meet various needs of use and live in any environment in the home or commercial setting indoors or out. Priced and Sold in set of 2 chairs. -- Please Choose an Option --	20.5"L x 16.25"W x 32.5"H: Seat Height - 17.5"